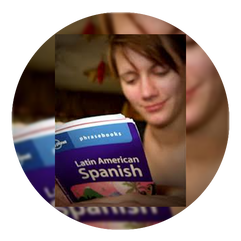 ​Our online lessons are designed for adults and teenagers wishing to learn Spanish online. Lessons include instructions related to conversation, grammar, pronunciation and reading. Students learn through one-on-one live online instruction, homework assignments and multi-media learning tools and resources. Lessons are flexible accommodating students’ schedules and pace. 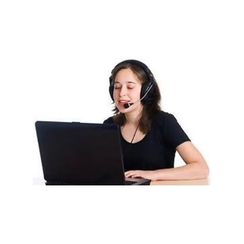 Our online tutoring program is designed to provide supplemental materials for students already enrolled in a Spanish course at school or university. We work with you and your Spanish teacher to provide a tailored one-on-one tutoring experience with a native Spanish speaking. Students frequently find conversing and reviewing topics outside of the traditional Spanish classroom increases their confidence as they participate in classroom activities and provides an opportunity to explore the language. We use Skype or Google HangOuts to connect with students and teach Spanish. To participate in online lessons, students need to have a regular strong internet connection, an account with Skype and at least audio capabilities (microphone and speakers/headphones). Video capabilities are recommended. Please contact us if you would like more detailed information about technology requirements. Each week our student or his/her classroom Spanish teacher completes a brief worksheet to help Kamalbe’s instructor know what to prepare for that week’s tutoring session(s). Kamalbe’s instructors have a wide variety of online resources and tools that students will use. Material from printed textbooks and workbooks is adapted for online use however; students are welcome to buy the textbook or workbook that our teachers use. Please contact us for more information about this option. Each online session is designed to be 1 hour or 2 hours long, although if asked for, we can provide longer lessons. 5 minutes at the end of each session is reserved for filling out our student survey and for your instructor to create his/her session notes. One hour sessions have 55 minutes of live instruction, and two hour sessions have 115 minutes of live instruction. Registering for online lessons or tutoring is easy. *After you have registered we will be in touch with you about scheduling and preparing for your first Spanish session! Please take a minute to learn more about our teaching method. Payment is available online through PayPal or through Xoom.com or bank transferring. Please contact us for more information about payments. Can I study if I am under 18? Students who are under 18 are welcome to learn with us. They will just need a parent or guardian to assist with online payment if necessary. You can make payments using PayPal. You do not need a PayPal account to make a payment. PayPal accepts Visa, JCB, Master Card, American Express and other major credit cards. Reservations can be cancelled up to 10 hours before each lesson. Cancellation of a reservation has no fees, but if you cancel less than 10 hours before your class is due to start, your payment will not be refunded for that session. You have 30 days to use all of your classes from the first day of purchase. If you do not finish your lesson pack within those 30 days, you will not be able to use the remaining lessons on your lesson pack after the 30 day period has expired. You will lose the unused sessions on your lesson pack.